Great taste producer. Gluten free. Vegetarian Society approved. Suitable for vegans. 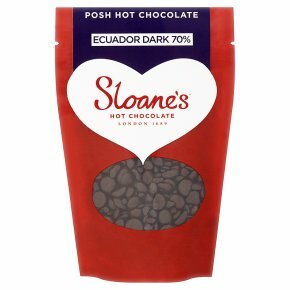 The Perfect Posh Hot Chocolate: 1 Scoop 3-4 teaspoons of beads (25g) into your cup. 2 Top up with 200ml of Hot semi skimmed, oat or soya milk. 3 Stir the chocolate beads until fully melted. Relax and enjoy.